Letters / Afghanalong for Afghans! Thought I’d take a break from writing my latest novella about hat felting, to bring you this Important Public Service Announcement. Ann and I are mighty pleased to announce the first-ever Mason-Dixon Knitting Community Project. 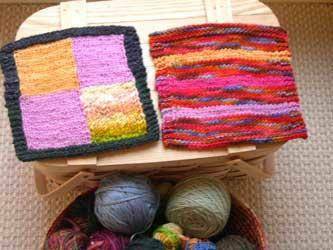 We would be thrilled if you would join us in making knitted patchwork afghans for people who need them in Afghanistan. Click this link to find out more about Afghans for Afghans, the organization to which we will donate our finished blankets. I did these with leftovers that were wasting away in my stash. Finally, the handpainted merino from my ghastly first sweater has a chance to redeem itself! 2. For each square we receive, we will place one entry in our monthly drawing for fabulous Rowan and Jaeger Yarns we got in the Liberty’s sale . (Note to all you colonials out there: think of the provenance! We’re talking Liberty of London! Second only to Holmfirth in the hearts of Rowanettes!) For the next six months, on the first of each month, we will do a drawing from the names of those who sent in squares during the previous month. Then we will toss out the old names and start collecting names for the next month’s drawing. The more squares you send in, the more entries you get. 3. How are we going to put these afghans together, you ask? An old-timey Sew-Up Bee! We are hoping to host not one, but two old-timey Sew-Up Bees, one in Nashville and one in Manhattan, to be held on a Saturday or Sunday afternoon in late summer/early fall 2004. We will give at least a month’s notice of the date so that anybody who can get themselves within range of either city can make it. It would be nice to have some help sewing up the blankets, but the real purpose of these gatherings is just to be able to do some real-time yakking and socializing with knitting pals. 4. BUT WAIT! There’s more! At the Sew-Up Bees, there will be tasty treats. 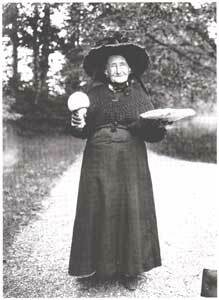 We may even run out to greet you, wearing handknit shawls and hats and bearing giant mushrooms! But don’t count on that last part. Ladies and Dudes: Start your needles. Or your swifts or whatever. If you’re lucky enough to have a Fiber Arts Boy or Girl nearby, get them knitting too. Think of all the squares we can knit during March Madness alone! (Note to Brits and others who may be unfamiliar with our more peculiar native customs: March Madness is an endlessly televised college basketball tournament. It is no coincidence that I took up knitting again as a newlywed in March 1992, when the harsh reality — Marriage Means Watching College Basketball — finally sank in.) When you’re ready to send in squares, email Ann or me and we will give you the mailing address. Thanks for reading this, and considering this project. The problem is that when I read a posting, such as this one, that is so potently inspiring, I want to rush from my desk at work and assume the knitting position at home. I love my work, but I begin to worry that I love knitting more. I just wanna make squares. kay!! KAY!! afghans for afghans project makes my public service spirit soar!! count. me.in. again. and again. and againg. etc. i have a snack request…your moms cupcake brownies please. and those yummy marscopne walnut thingies you make on holidays. I love it! what a wonderful way to use up odd balls! and i am particularly looking forward to the sew-up bee! what fun! Can a faithful “lurker” join in? I’ve been reading y’all’s (is the punctuation on that right–I’ve been out of the south too long!) blog for a couple months now. I promise to help with the sewing-up! Count me in! Sounds like a terrific project. In the spirit of March Madness and all the betting pools that go on, how ’bout a pool for the total number of afghans that will come out of this? I would like to join in too if this is open to London Rowanettes as well! Hey maybe if its big enough who knows the afghan may stretch across the Atlantic and we could sew them up at Libertys also? Perfect, gals! Fiber arts & B’ball go together in my house: I made an entire quilt during March Madness 2001 as my beloved Devils played their way to victory. And do give ample advance notice of the sew-ups, as attendance would be a real joy. Maybe a battle of the yummies, as Lis references some pretty tasty NYC treats? What are your specific temptations, Ann? Ann will be serving grits. Just kidding! I love the idea of an afghan stretching across the Atlantic. OF COURSE the London Rowanettes, aka the Liberty Knitters, are invited! This is a world-wide invite! Aussies! Hong Kongers! New Zealanders! American ex-pats in France! Italian ex-pats in America! French! Germans! Scandinavian master knitters, male and female! Lurkers: come out, come out wherever y’all are! Okay, you’ve got me! Another lurker decloaking…I’d love to do some squares! Love this blog! Thanks for all the inspiration! I`m game! Didn`t think I would look forward to knitting squares…but I do. And what a great reason to visit ‘the stash’. As long as it includes the four food groups (fat, salt, sugar, and beer), you’ll be seeing it at the Mason-Dixon Knitting Southern Bureau Sewing Bee. I have to comment on the name afghan. Here in New Zealand an afghan is a type of chocolate biscuit made with cornflakes. What you call afghans we call Peggy squares, named after a four year old girl who inspired a drive for knitted squares to make into the blankts during the 1930’s. There was even a line of knitting wool named after her. If you like I could send you the recipe so you can eat afghans while sewing up your afghans. You guys rock! I’ve been enjoying your blog for the last few months now (I’m temporarily underemployed and enjoying myself by learning about the wonders of net blogging), and have been inspired by your blog and others many a day, but this takes the cake – we get to 1) knit; 2) for charity; 3) use up odd balls; and 4) win yarn?! I’m in! Look for me soon on pretty posies – I’m starting a blog of my own replete with many a knit-behind to catch up with all the wonderful things that you guys have been doing in Blogville. Keep up the excellent work – I visit you guys daily. Finally, a knit-a-long I can commit to! But, um, tasty treats DOES include wine, right? How does one knit without wine? (Better, is probably the answer, but I have not tried that method recently.) Have not decided whether to commit to the southern version (older son determined to collect a Nashville hockey banner) or the northern version (NYC SHOPPING!!! )…or maybe both? hmmmm….do the nashvillians need a meeting place? ann, if your group wants, perhaps we could open up Angel Hair Yarn Co. for a Sunday avvo sewing-up meeting! and as for wine, we call it “knitting water” in these parts (the Nashville knitting guild used to have retreats at State Parks, at which alcohol was not *really* allowed….so we called it knitting water when we brought it, in case anyone was listening through the thin walls of the chalet we rented to sleep in….) let me know if you want to use the venue…. WOOT! I’m in!! Will you mail some of those aformentioned goodies to Florida tho? Or BRING em down and have a winter retreat right here!! DOUBLE WOOT!!! Count me in too! It’s kind of an extension of your dishcloth-along as I can’t really bear the idea of knitting something and then using it to wipe stuff off the kitchen counter but the patterns are so sweet!! Excuse my ignorance but why are they called afgans? I never have understood that…. oh… and can we crochet or would you prefer just knitted squares? Count me in – along with Jacinta in London – am sure we can manage a transatlantic version. How many eight inch squares do we need for an Afghan? PS. – when I was little we had an Afghan living next door – he was a gorgeous golden-coloured dog, with a long plumy tail…..
Love the idea of stash reducing for charity. Great! I’m in as well. Although we won’t be able to sew them together and have the treats, maybe the part of it for a frenchie ;-). Is eight inches equal to 20 cm? Afghan cookies, afghan dogs–I love it! Afghans for Afghans while Eating Afghans with Afghans At Our Feet. 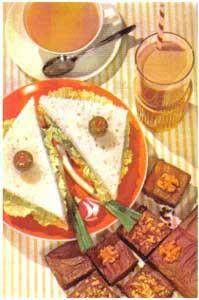 Pam–Sewing up squares at Angel Hair with knitting water on the side? Priceless! Thanks for your invitation. That would be a hoot. And I must say, having just returned from the church moms’ retreat at a Tennessee State Park, that knitting water is pretty much a requirement when the nearest restaurant features fried pickles as an appetizer. Sarah W–I know about that problem of actually using my dishcloth. Kay pointed out that it’s not exactly Jaeger Pure Silk, and it didn’t take three weeks to make the thing. Maybe I’ll whack off an inch from each side and turn it into a square. And France/England/New Zealand/Norway–hooray and welcome! We will figure out the Treat Issue as we go. No knitter left behind . . .
Jill–we will research the complicated issue of how many squares makes a blanket. We were thinking that if this project netted two squares (one from me and one from Kay), we would have a blanket 8 x 16 inches. What do y’all think? Philosophical question: How Big Is An Afghan for Afghans? I’m another lurker comin’ out of the woodwork. I have so enjoyed reading y’alls blog. And I would love to participate in making squares using dishcloth patterns. And knitting water, what a hoot. I’m going to have to remember that for my Monday night knitting group. Waah, I remember Angel Hair Yarn! This sounds like a great project. Ann, have we ever seen the “ghastly first sweater”? Count me in as well! The square will be most helpful in my current scheme to reduce my stash to ZERO! You guys are the best and this is by far the best blog ever! Dear Everybody–I cannot tell you how exciting it is to see your enthusiastic response. I had a psychic insight last night that long-dormant stashes were being disturbed all over the world. And the lurkers! How wonderful to have flushed you out of your lairs! Feel free to use the colors that inspire you. The gift of a bright, cheerful afghan will have a tremendous impact on those who have little if any possessions. Consider using some shade of the color green — . green is the beloved color of Islam. Use white or very light yarn colors sparingly since they are difficult to keep clean. Natural wool and wool blends offer more warmth. Cotton and cotton blends are also useful. Acrylic and synthetic-blend fibers are practical and more economical (although using a double strand to increase warmth is often a good idea). Please avoid using delicate fibers such as some silks and novelty yarns. Hi! Lurker from the Far East would like to play a part too! Thank you for organizing this great project! At first I thought I was too busy to do this, but then I remembered three balls of handspun purple wool that I love working with and can’t think of what to do with… so I’ll bite 🙂 I’ll also second the question about whether we can crochet squares or just knit them. Normally I hate crocheting, but variety is kind of nice. Yet another lurker… I’ll join my fellow Scandinavians (Finland’s not technically part of Scandinavia, I think, but who cares) in knitting some squares fot this project. I’ve been trying to get rid of my stash, and this seems like the perfect project for some of the stuff I’ve got. OK what can I say – that is some AMAZING blue baby! I kind of hope it was edible…. and now I’m kinda wishing I could have one for my birthday… but these days mine start with a 4 and it would be a bit unseemly to eat a whole blue baby cake at that age don’t you think? Finns, Candian ex-pats, Far Easterners, Memphians! Welcome and hello! Gwen, as far as I’m concerned, crochet is just dandy. Unless Kay has some Overriding Aesthetic Visual Statement in mind, I think some crocheted squares would be beautiful. And how great that you have some stash to use. I’m scheming up what I plan to do, and I’m torn between teaching myself a little aran or doing miniature log cabin patterns. Knowing me, I’ll end up in November cranking out garter stitch in a panic because Kay will have finished 2,000 squares and I’ll have done three. Sarah–I wish the blue baby were some kind of marzipan sculpture, but it looked more like a paint job on a baby doll. Talk about Aesthetic Visual Statement. I’m going to be a fusspot, though, and request No Granny Squares, because unless we have 25 of them, I think they will look lonely and be hard to join. Anybody who wants to submit 25 Granny Squares, git stitchin’! Any group that wants to form a Granny Square Cooperative Enterprise and make 25 or 42 or some multiple thereof, git stitchin’! When you said you weren’t going to greet everyone with giant mushrooms, I was so disappointed I nearly wept, but now I have myself together and am gearing up to knit some squares! Hmm, you said plant motifs were okay, so how about fungal motifs? Mushrooms? Uh, sure, Mariko! Fungi? Greeeaaaat! What kind of mushrooms are we talking about? I’ve completed my first square! There’s a picture on my blog. I love this whole idea. Thanks so much for organizing it. Where do we send our squares? Can’t wait to join in the squares knitting at Liberty central with Jacinta and Jill! Jessica, I will email you the address. Everybody else, email me when you’re ready to ship squares, and I will send it to you as well. It is a thrill, corny as that may sound, to think of square-knitting going on in the Art Bar at Liberty’s………. Scottish contingent reporting for duty SUH ! … such disappointment over the no crochet granny squares rule though having just mastered the bloomin’ things – however, not enough disappointment to induce me to embark upon 25 of them !! I shall stick to knitting and come with something suitably celtic to add to this international buffet (okay, so I’m mainly here for the snacks ! )Fab idea you enterprising pair ! Heather. Just stumbled across this blog, and I love the afghan project. Canada seems under-represented, so here I am in Toronto, needles and hooks and stash poised to begin. Maybe I’ll start with a log cabin square. Do you want people to indicate fibre content when they send in their squares, or will you just mix’n’match and hope for the best when the things are washed? Oh, I will definitely be making a square for this. That will be my next little project. 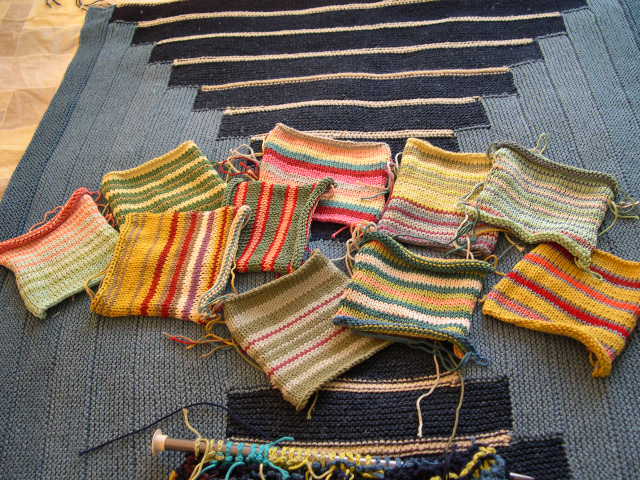 you’ve inspired me…..”many hands make light work” for a giant afghan project. the finished pieces will be breathtakingly beautiful, artistic statements really, as we all define the 8″x8″ square differently. thank you for this treat! would you be kind enough to send the address for mailing? I’d love to post a button for this afghanalong on my blog… do you have any plans to create one? Me too, me too! Nearly immediate knitting gratification, a worthy cause and rowan-iffic incentives – – who could ask for more in a knitalong? Please sign me on up!